We had some apricots that were a bit too ripe for making jam so instead I cooked them with vanilla sugar to make a fruit sauce to have with ice-cream or yoghurt. I hadn’t realised how much it would make so thought I’d use some to make muffins for breakfast. Many years ago, one of my sisters bought me a brilliant little book called Muffins which I use every time I’m making muffins. 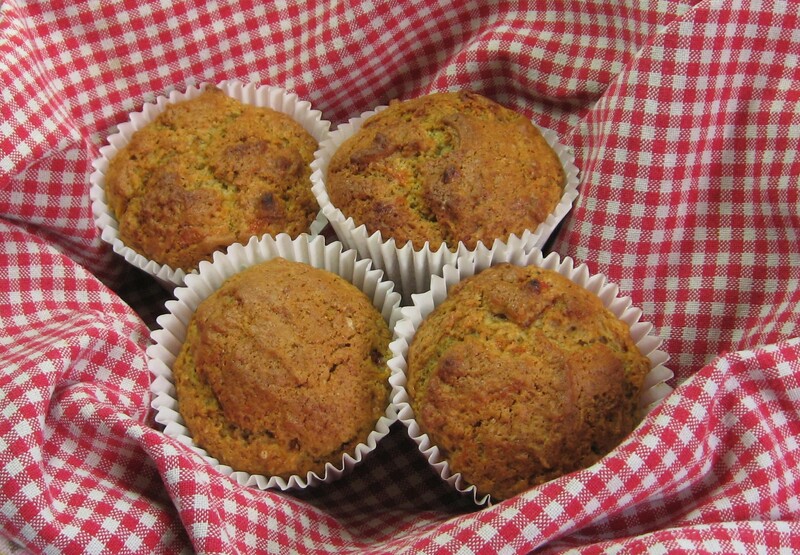 The basic muffin recipe is easily adaptable, and there are lots of other variants inside. I used the recipe for orange – carrot muffins as a starting point and then adapted it somewhat for my cooked apricots. Add the water to the cooked apricots and stir well. In to a large bowl stir with a fork, flour, sugar, baking powder, bicarbonate of soda, salt and cinnamon. In a separate bowl, beat the egg. Then mix in the cooked apricots and the sunflower oil. Spoon into the muffin tray. Bake for 20-25 minutes until the tops spring up when gently pressed. Allow to cool for a minute or so on a cooling rack before eating. Makes 12 standard sized muffins.